These deliciously baked pork chops will be a family favorite, with ease of preparation and a flavorful homemade sauce. 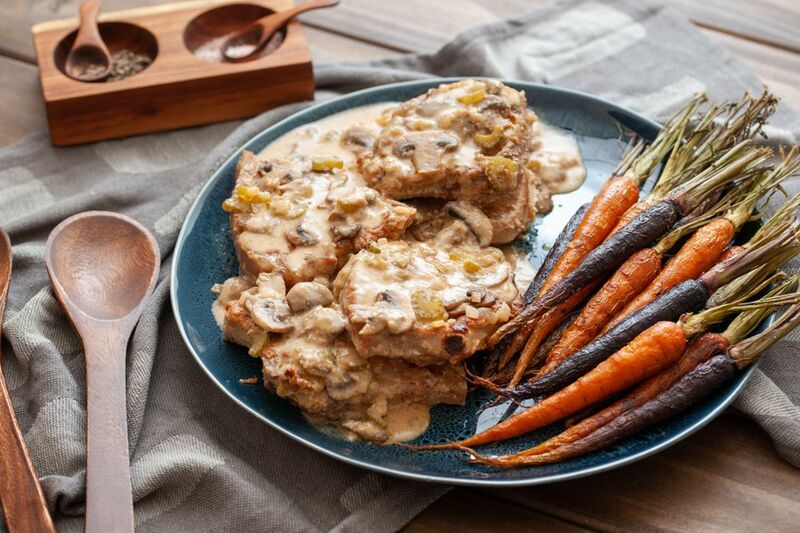 The pork chops are baked with sliced mushrooms and a flavorful homemade sauce. Add mashed potatoes or rice and your favorite vegetables for a tasty, satisfying meal. We used center cut loin pork chops in the recipe, but feel free to use rib chops or meaty country-style ribs. In a wide, shallow bowl, combine 1/4 cup of the flour, the paprika, 1 teaspoon of salt, and 1/4 teaspoon of pepper; stir to blend well. Dredge the chops lightly to coat all sides. In a large skillet or sauté pan over medium heat, melt 2 tablespoons of butter. Add the mushrooms and cook until tender and golden brown. Remove to a plate and set aside. Add 1 tablespoon of olive oil to the pan and brown the pork chops for about 3 to 4 minutes on each side. Remove the pork chops to a baking dish, top with the mushrooms, and set aside. Add the remaining 4 tablespoons of butter to the pan and add the onion and celery. Cook, stirring until onion is translucent. Add the remaining 1/4 cup of flour to the skillet; stir to blend into the onion mixture thoroughly. Cook the roux mixture for about 2 minutes, stirring constantly. Add the chicken broth and milk. Cook, stirring, until thickened. Stir in the mushrooms and add salt and pepper, as needed, to taste. Stir in the lemon juice. Pour the sauce mixture over the chops in the baking dish. Cover the pan tightly with foil and bake for 45 minutes to an hour, or until the pork chops are tender. Serve with your choice of vegetables or side salad and enjoy!